In 2006, we started our business inspired by the Irish “Bed and Breakfast” models, which are hospitality and social breakfast with local products. However, our hospitality is something which goes beyond a mere service of “bed and breakfast” as in our location you will get suggestions on what to do and to see in Palermo and Sicily, we will provide you with a map of the historical city center and we will recommend you restaurants which meet your needs the most. We will tell you about secrets of local cuisine and we will help you solving those little matters that can occur during a journey. On request, we plan nights out with our guests. If you want to see reviews written by our guests, click here. If you want to book now, click here. 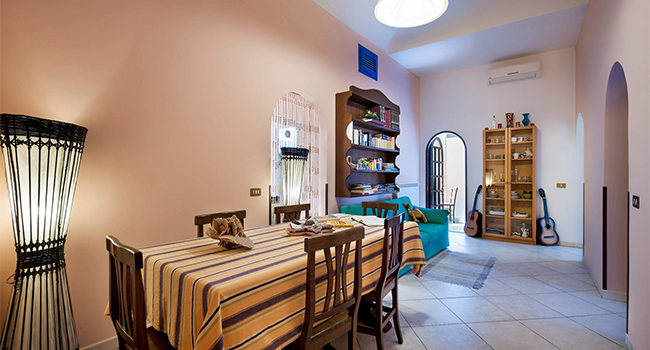 Bed and Breakfast Alla Vucciria is located in an ancient medieval street in the historical center of Palermo, near the well-known marketplace La Vucciria and the baroque square of San Domenico. 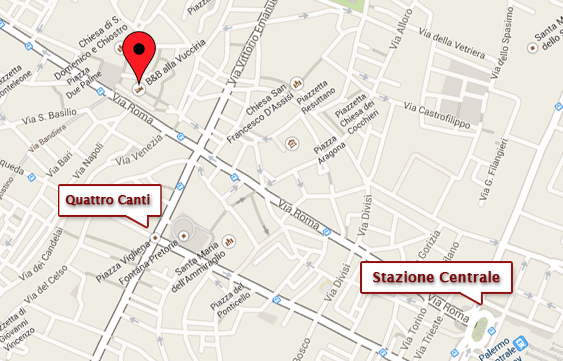 Leaving from our B&B you can easily visit the most important sites on foot, namely: Quattro Canti, Royal Palace, the Cathedral, ancient and modern art’s museums, churches and the three main historical marketplaces La Vucciria, Capo and Ballarò. At evenings and nights, La Vucciria is a place of immense possibilities for eating, drinking and having a good time. Click here to know how to arrive. In the hall, you will find a bookcase provided with relevant information for your journey and foreign languages books. On the dining table, you will be served breakfast, both salty and sweet. Our B&B is on the third floor of a XVII century’s palace, which unfortunately has no elevator. Therefore, access is not favorable to disabled people. It is easier to arrive here from the seafront; anyhow, you can leave your car in a garage on payment that is 350 meters far from the B&B. On request, you can use the kitchen; we arrange a “Tour by night” during which you can taste the real street food and know more about the streets and the stories telling about the world importance of Palermo during several centuries. Spoken languages: Italian, English, French and German.